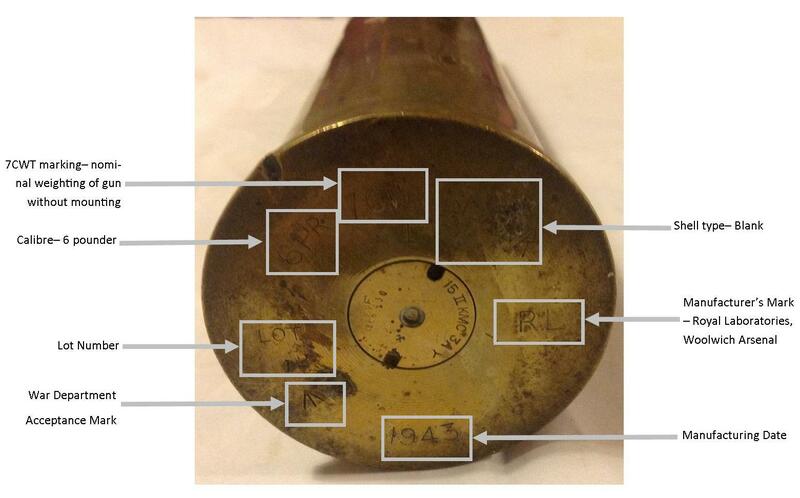 A few weeks back I looked at a Second World War blank 6 pounder shell casing. 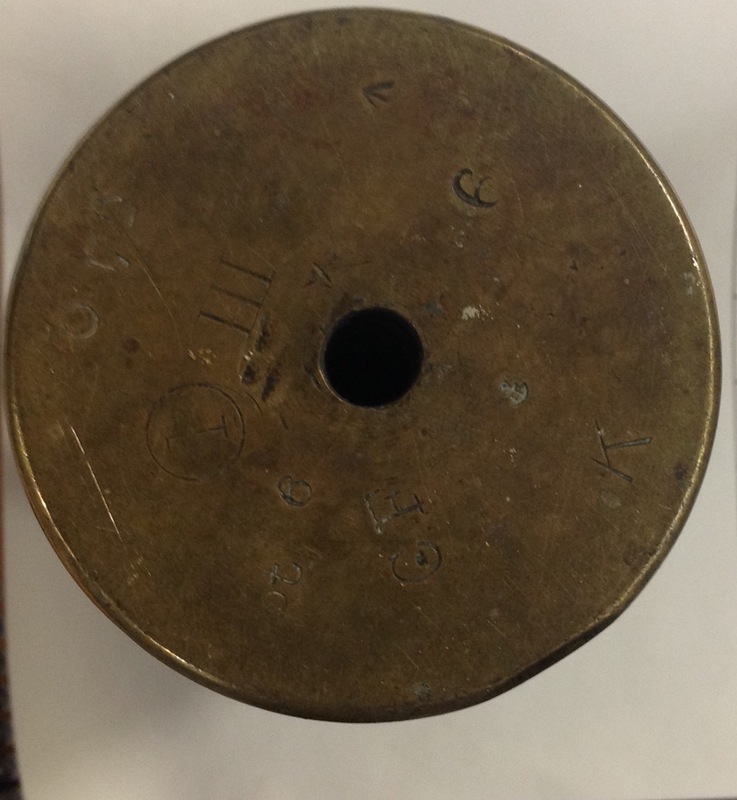 Tonight I have another 6 pounder casing used as a blank, but this one is much earlier, and although I cannot provide an exact date, my gut is suggesting it dates to before the Great War: The first thing to notice about this casing is how short it is. 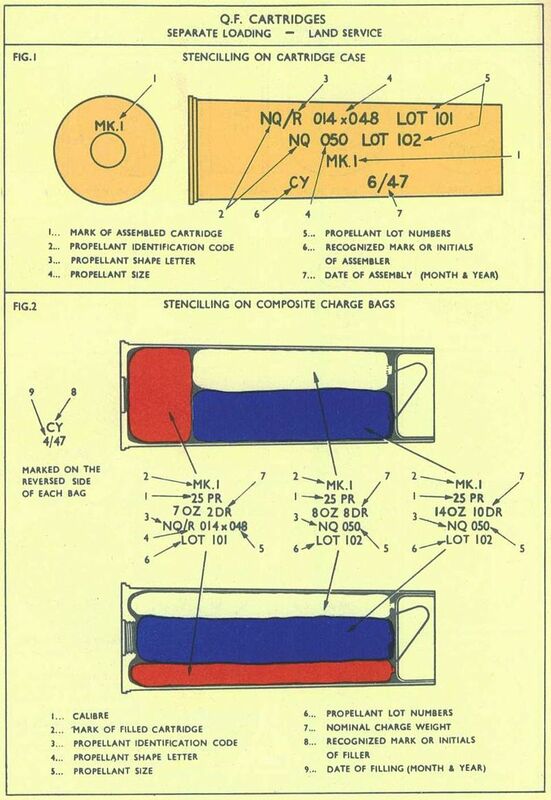 It was typical to cut down spent full size cartridges into shorter version to use for a blank round- the lower power needed less propellant so a shorter case would suffice. 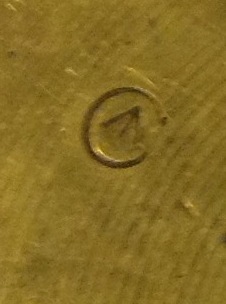 The rough edge is typical of these cut down blank rounds, the modifications being done at a unit level. 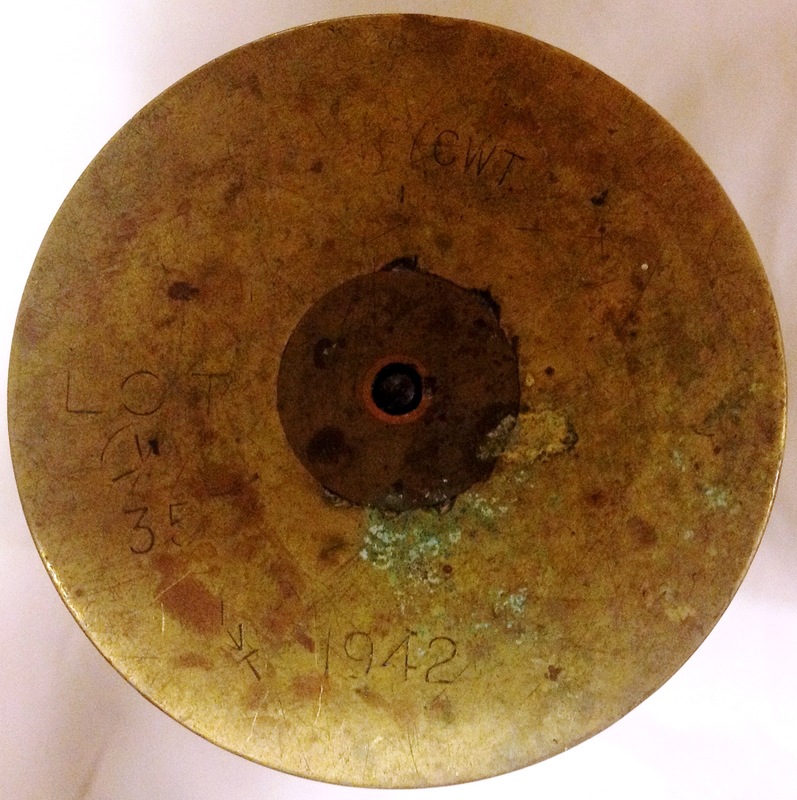 The base of the casing has a profusion of markings: My thanks go to Jeremy Churchill for his help in interpreting the markings: I suspect that this cartridge was originally for a 6 pounder quick fire naval gun such as this one: These guns were obsolete by the end of World War One, but continued in use as saluting guns, for which a cut down blank cartridge such as mine would have been ideal. 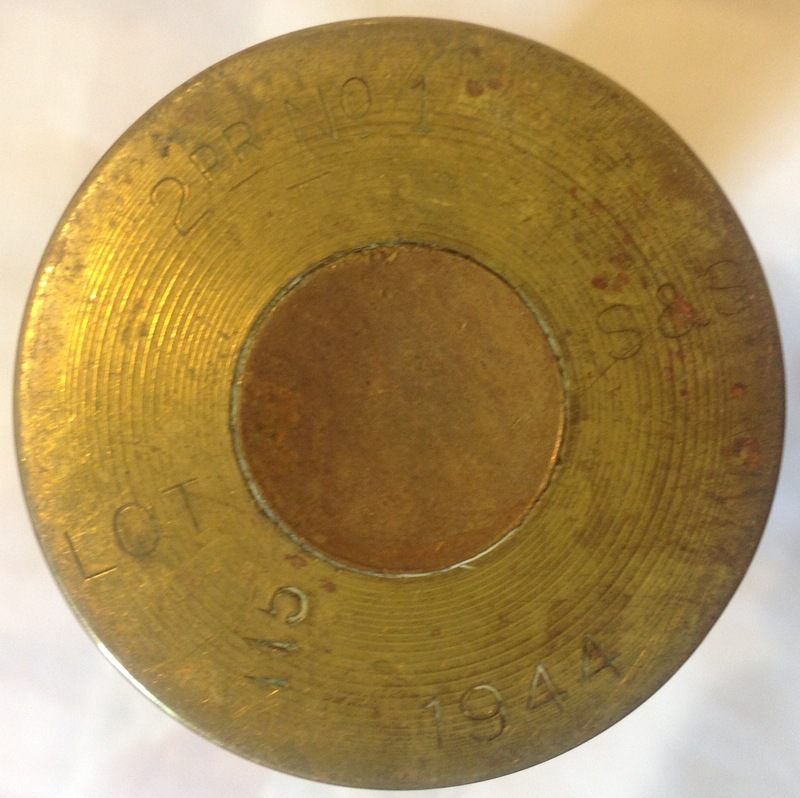 This entry was posted in Pre WW1, Shell Casing on April 19, 2017 by hatchfive. 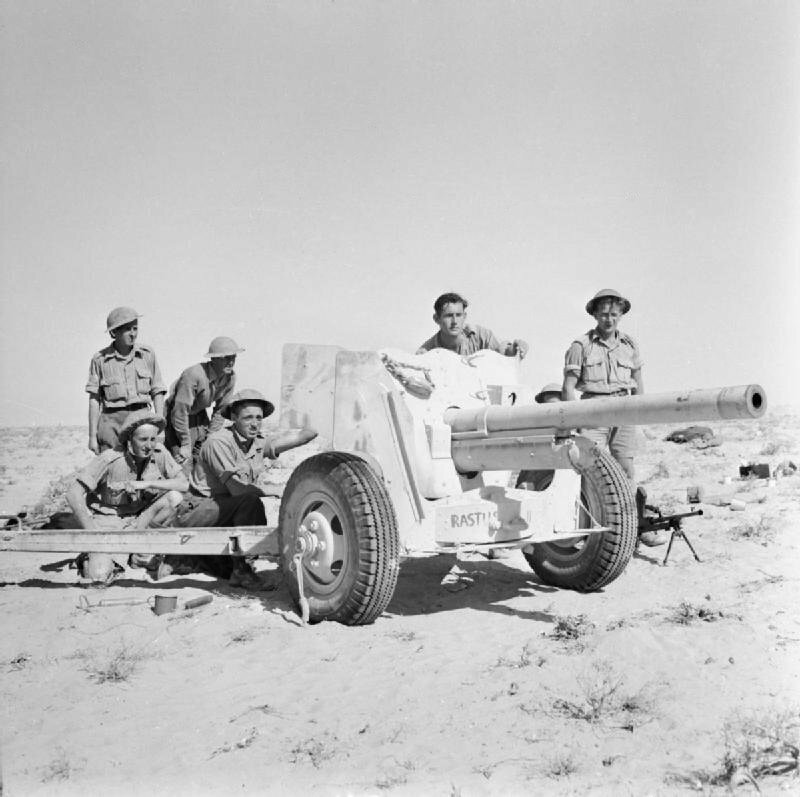 The 6 pounder anti-tank gun, with a muzzle velocity of 2,700 feet per second, has been designed by the British for use against enemy armoured vehicles that are not vulnerable to the 2-pounder at distances over 200 or 300 yards. A 57-mm gun, the 6-pounder will be able to engage tanks at much greater ranges than the 2-pounder, although the latter will still be important to the anti-tank defence of individual formations and units. The 6-pounder is usually mounted on a low 90-degree split-trail wheeled carriage, but it is also being installed in certain tanks. In order to facilitate the quick adoption of the proper gun for the circumstances, the wheeled carriage of the 6 pounder is designed that the 2-pounder may be mounted alternatively. It is intended that the 6-punder be standard in corps and army anti-tank organization. 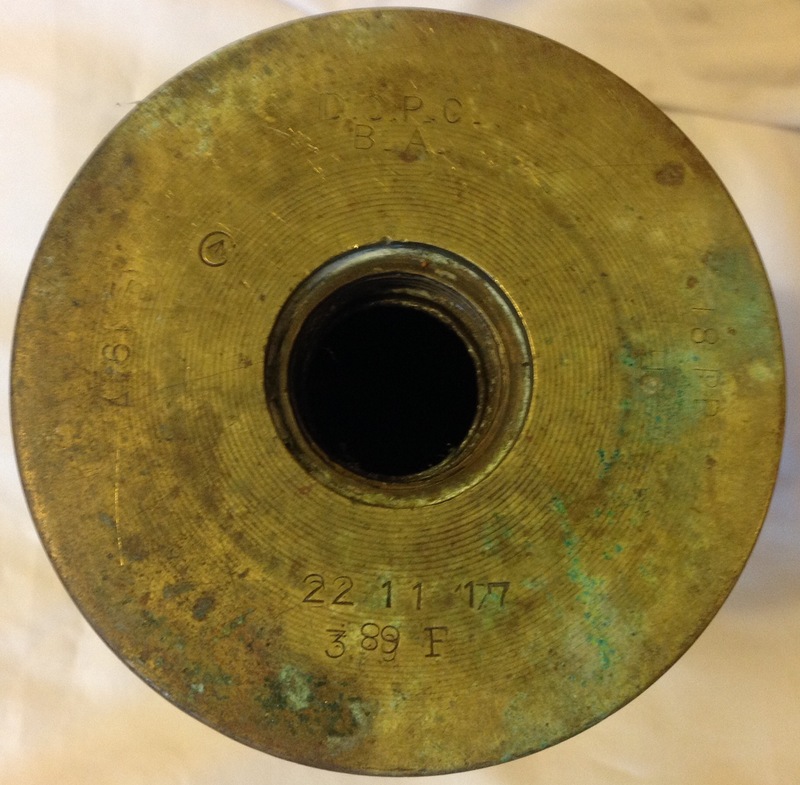 Tonight we are looking at a shell casing from the 6 pounder anti-tank gun, this example being a blank cartridge: It is made of brass and is impressively large, as with all British shell casings there is a profusion of markings on the base: I have interpreted these as well as I can: These shells are always impressive things, and the markings make them fun to interpret. Sadly they do not come up at a price I am willing to pay too often, so when they do I always snap them up. 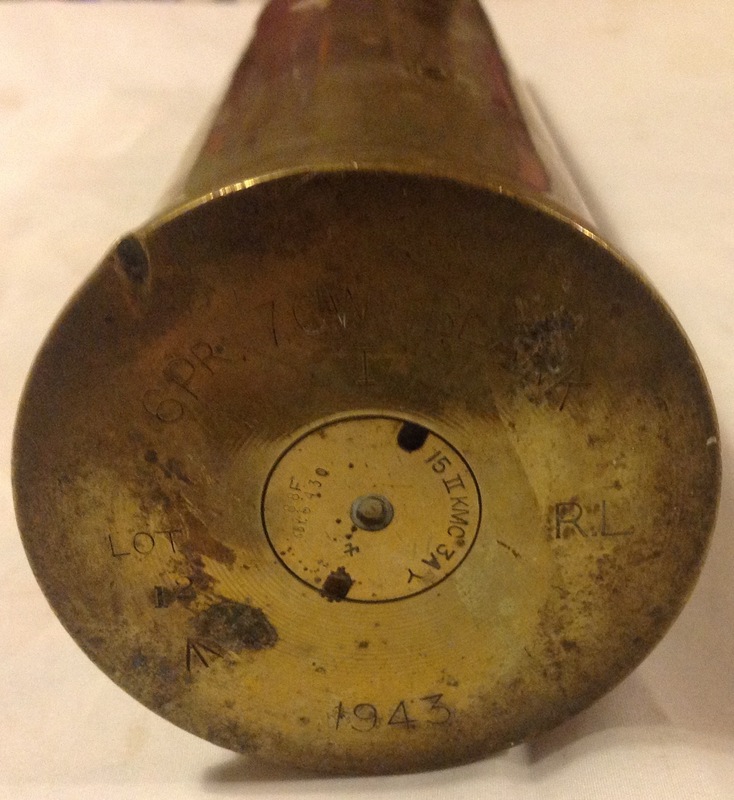 This entry was posted in British Army, Ordnance, Shell Casing, WW2 on March 25, 2017 by hatchfive. 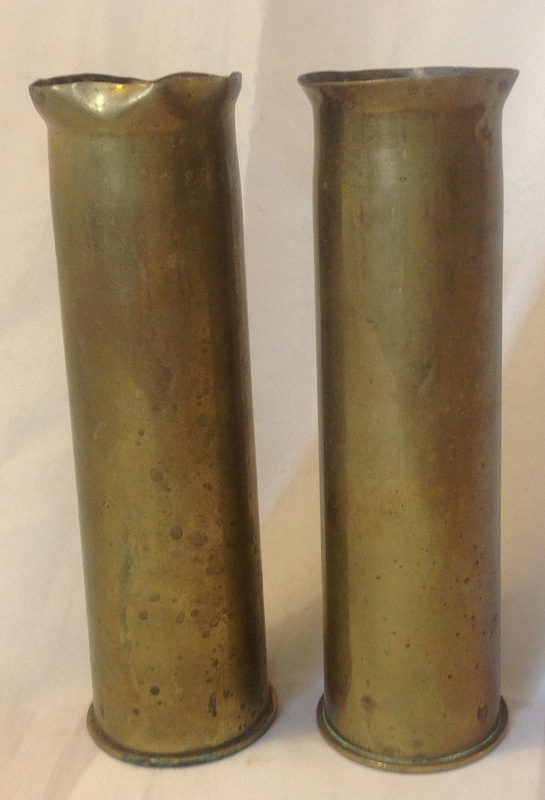 Tonight we have a pair of small brass shell casings: These casings are both from a naval 2 pounder ‘pom pom’ gun, the cases identity being easily determined by the head stamps on the bottom: From this we can see that they were manufactured in 1944 and are 2 Pounder No1 round. The manufacturer is ‘S&S’ which is believed to be Sidney Silversmiths of Sheffield. The Royal Navy had identified the need for a rapid-firing, multi-barrelled close-range anti-aircraft weapon at an early stage. Design work for such a weapon began in 1923 based on the earlier Mark II, undoubtedly to utilise the enormous stocks of 2-pounder ammunition left over from the First World War. 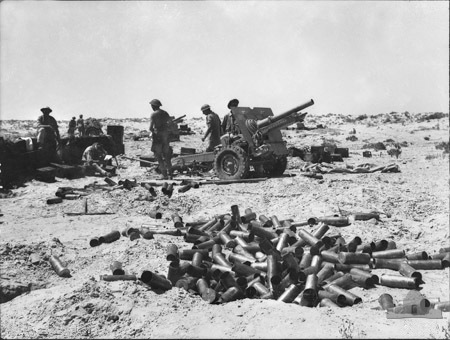 Lack of funding led to a convoluted and drawn-out design and trials history, and it was not until 1930 that these weapons began to enter service. Known as the QF 2-pounder Mark VIII, it is usually referred to as the multiple pom-pom. 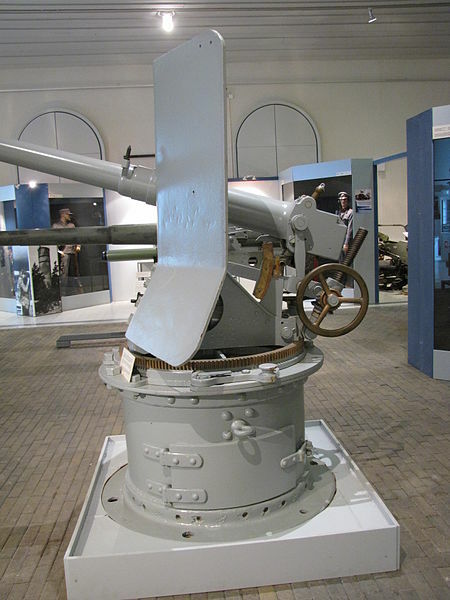 The initial mounting was the 11.8 to 17.35 ton, eight-barrelled mounting Mark V (later Mark VI), suitable for ships of cruiser and aircraft carrier size upward. From 1935, the quadruple mounting Mark VII, essentially half a Mark V or VI, entered service for ships of destroyer and cruiser size. 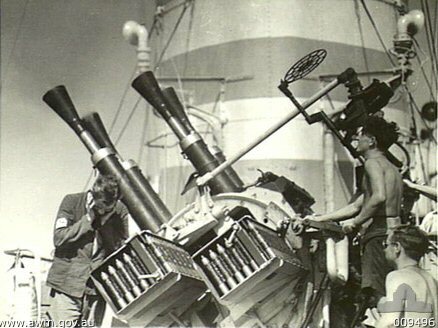 These multiple gun mounts required four different guns and were nicknamed the “Chicago Piano”. 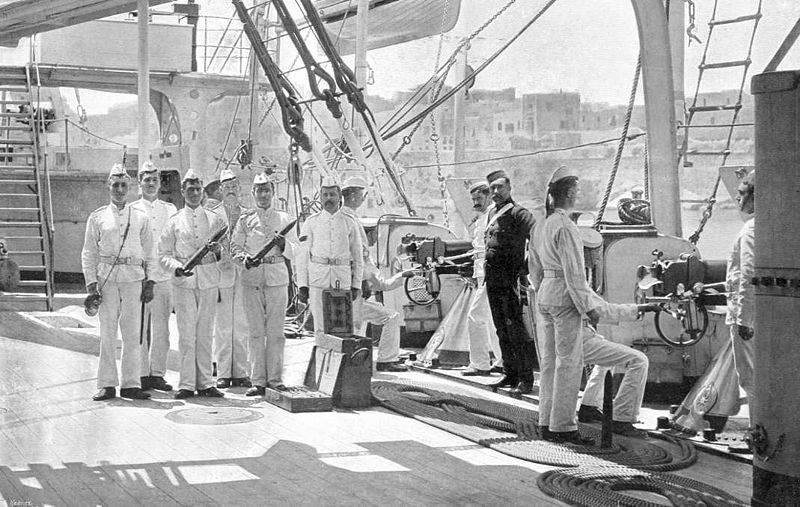 The mount had two rows each of two or four guns. Guns were produced in both right- and left-hand and “inner” and “outer” so that the feed and ejector mechanisms matched. Single-barrelled mounts, the Mark VIII (manual) and Mark XVI (power operated), were also widely used, mainly in small escorts (such as the Flower-class corvettes) and coastal craft (especially early Fairmile ‘D’ motor gunboats). 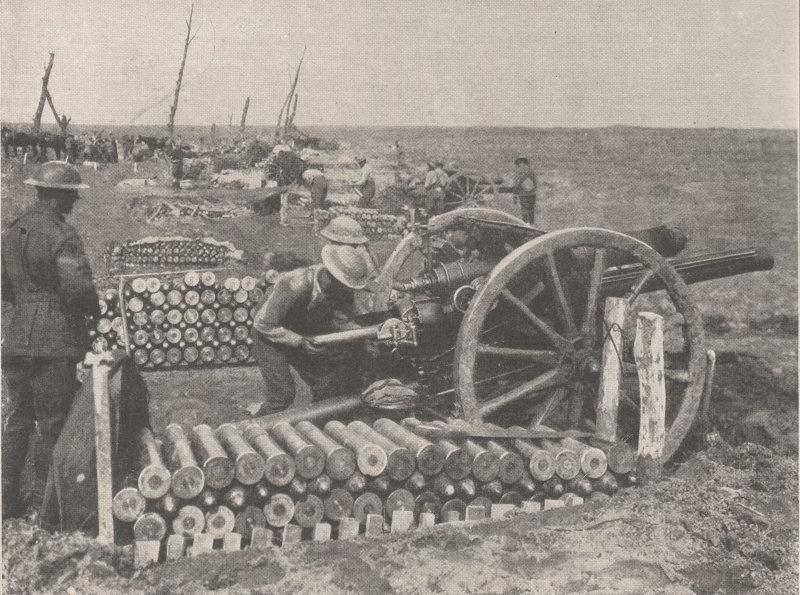 An interesting feature was the very large magazine, from 140 rounds per gun for the eight-barrelled mount, to 56 rounds for the single mounts. 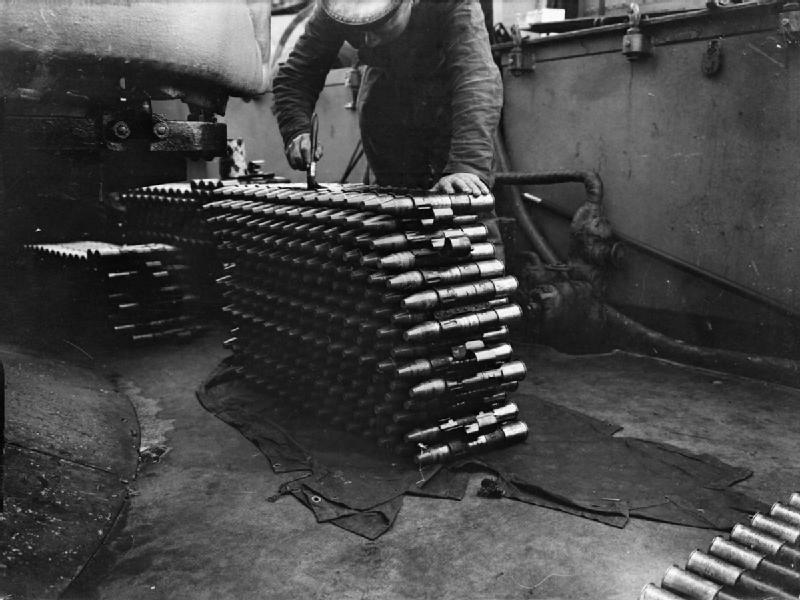 This large ammunition capacity gave the eight-barrelled mount the ability to fire continuously for 73 seconds without reloading. A high velocity (HV), 1.8 lb. 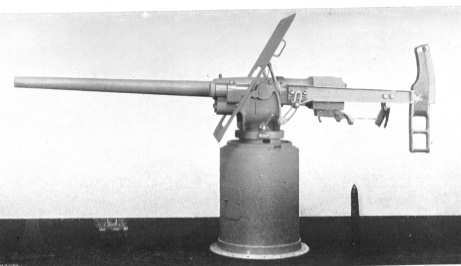 (820 g), round was developed for the pom-pom, just prior to World War II, which raised the new gun muzzle velocity from 2,040 ft/s (622 m/s) to 2400 ft/s (732 m/s). Many older mountings were modified with conversions kits to fire HV ammunition, while most newly manufactured mounts were factory built to fire HV ammunition. 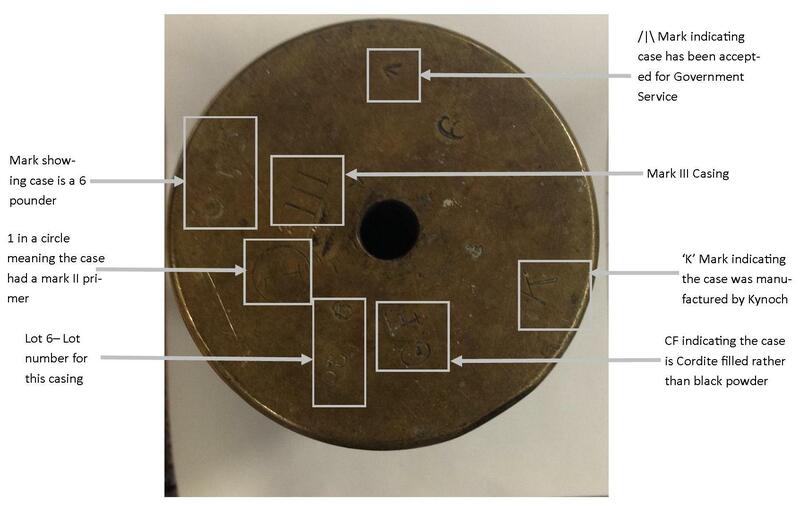 A mount modified or designed for HV ammunition was given a ‘*’ designation; for example a Mk V mount modified for HV ammunition would be designated Mk V*. 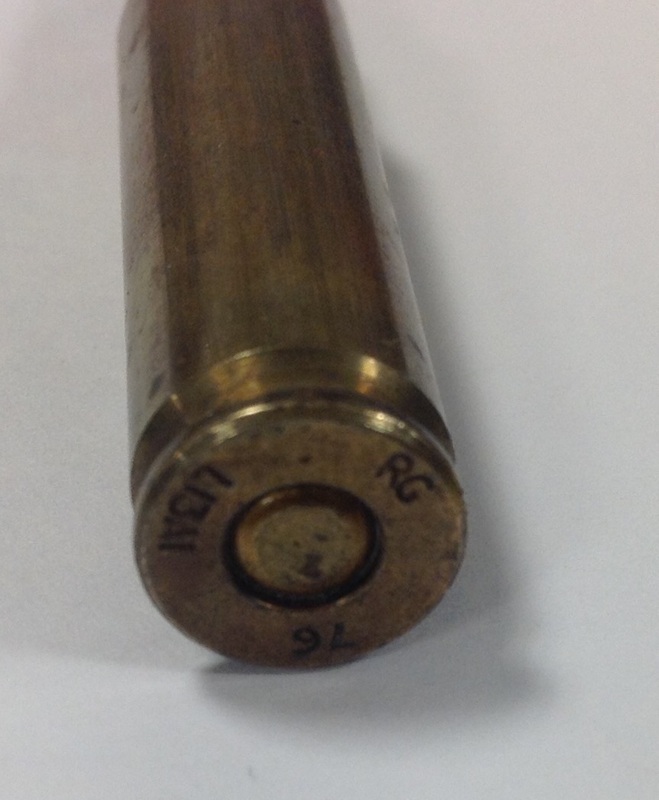 The following photograph shows the complete rounds, notice how short the brass case is compared to the rest of the round. The flaring visible on the ends of each casing seems to be very common and was done to turn the casings into a small vase as a souvenir. 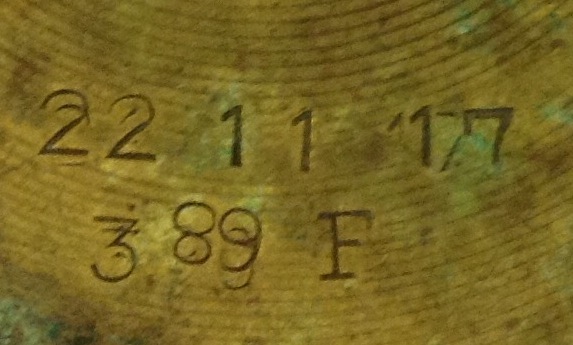 This entry was posted in Ordnance, Royal Navy, Shell Casing, WW2 on August 23, 2016 by hatchfive. 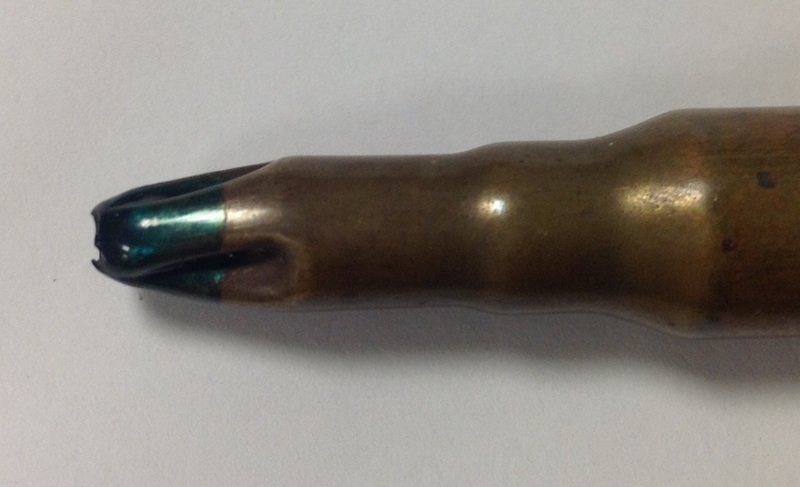 Blank ammunition is used during training exercises to give a much safe round that still makes the same noise as a live cartridge. These are fired both by troops to get used to using their weapons and at them by instructors to simulate the chaos of battle. 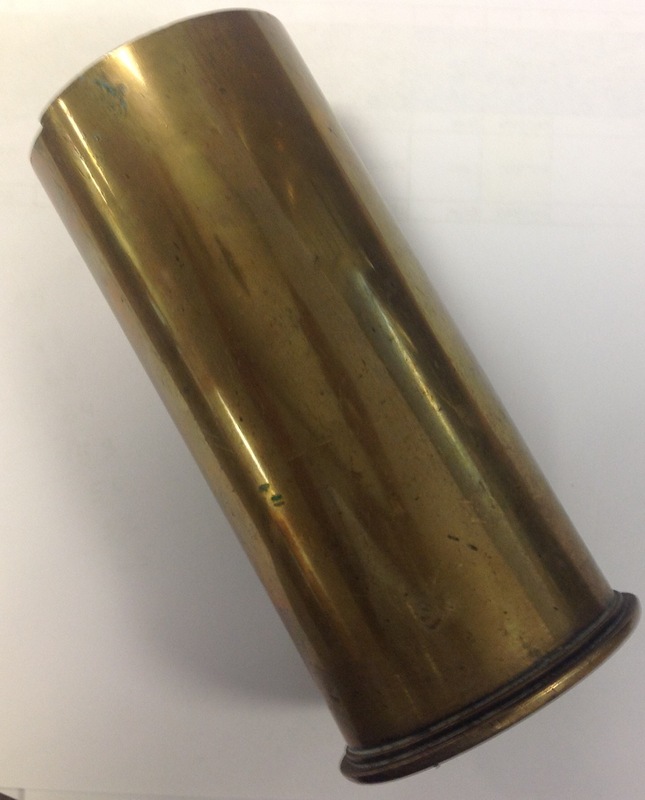 Tonight we are looking at a British Army L13A1 blank cartridge introduced in 1970: This cartridge is in 7.62mm calibre and replaced the earlier L10A2 cartridge which had been withdrawn as being 20% too heavy due to thicker than required casing walls. The L13A1 was 2g lighter than the earlier L10A2. Externally the round looks identical to its predecessor, with a long neck and an un-ringed Berdan Primer: As can be seen the headstamp has the cartridge type ‘L13A1’, the year of manufacture ‘1976’ and the initial ‘RG’. 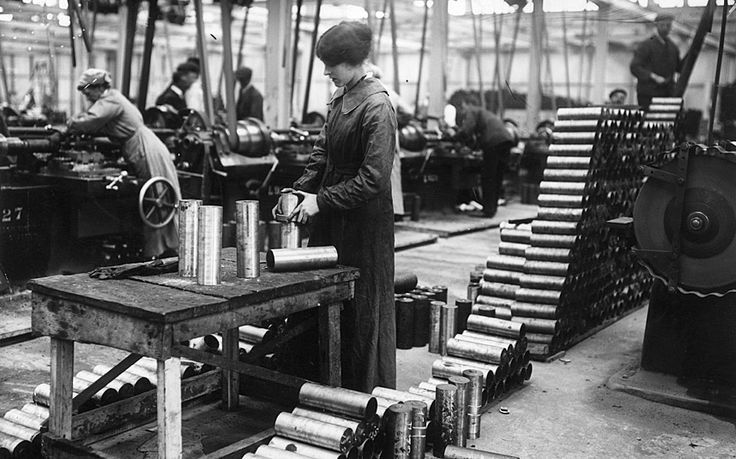 ‘RG’ stands for Radway Green, a Royal Ordnance Factory in Cheshire that was set up in 1940. The factory is still producing small arms for the British Army, but is now part of BAE Systems. The tip of the blank has green lacquer on it: This lacquer helped keep moisture out of the cartridge, ensuring it would fire successfully when needed. 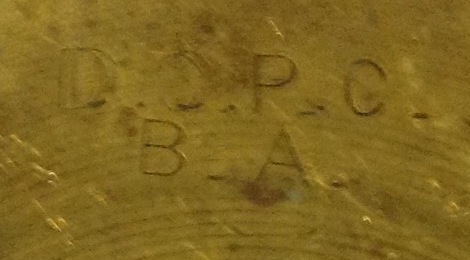 This entry was posted in British Army, Post WW2, Shell Casing on January 4, 2016 by hatchfive. 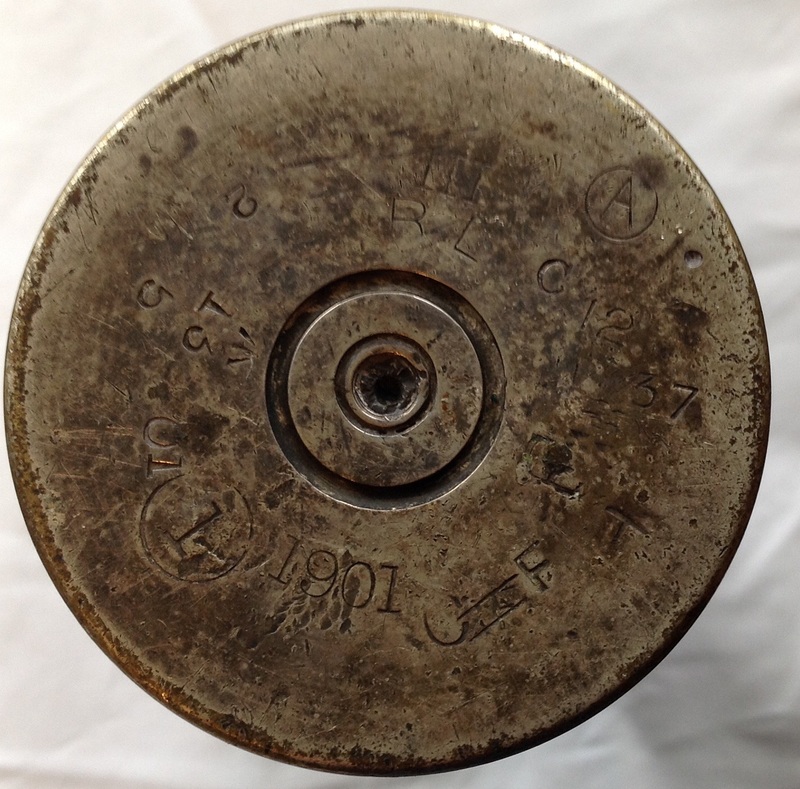 This entry was posted in British Army, Ordnance, Shell Casing, WW1 on December 5, 2015 by hatchfive.